Looking for a fun and meaningful family event this weekend? 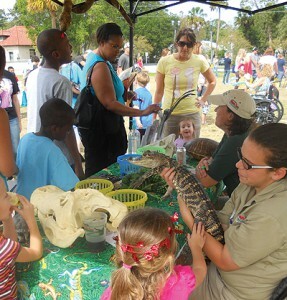 The 23rd Annual Ancient City Kids Day is coming to Francis Field this Saturday, October 27, from 11 a.m. to 3 p.m. The popular annual event is free to all and includes games, arts & crafts, giveaways and contests, bounce houses and live entertainment, as well as kid-friendly food and drinks available for purchase. The event is hosted by EPIC Behavioral Healthcare and includes involvement by more than 40 youth service organizations. While the kids engage in various games and activities, parents can learn about community resources available for families. One Blood will also be holding a blood drive during the event. T-shirts and goody bags will be handed out to all children who attend (while supplies last). Francis Field is located at 25 W. Castillo Drive in St. Augustine’s historic district. For more information, please call EPIC at (904) 829-2273 or visit epicbh.org. Goblins on the Loose!!!!!!!!!!!!!! Don’t worry, we are here to HELP! 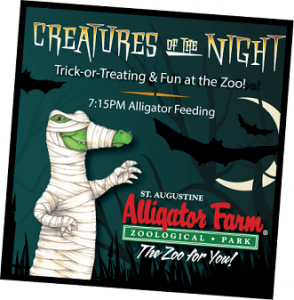 Halloween is a FUN night for families and friends and with a little planning, St. Augustine offers PLENTY of super spookilicious options for everyone’s style. The following is a list of community events and local attractions as well as specific neighborhoods that are especially welcoming to your little witches and warlocks.